In this tutorial I want to show you how you can enable 2-step authentication for YahooMail, Gmail and Outlook. Our email accounts contain tons of sensitive data worth protecting such as Credit Card information and other financial details, login details and other important data we won’t want another person to see, thus the need to properly protect our email accounts with 2-step authentication method. Your email account is as secure as your password, but you should know that it’s only a matter of time before any password can be cracked. No matter how complex you think your password is, there is an advanced cracking tool out there waiting to crack it. Two-Step authentication is one of the best things you can do to protect your email accounts, previously on this blog I have discussed “How to enable Google 2-step verification on WordPress” and “How to enable 2-Factor Authentication for your Social Media Accounts”. 2-Step authentication will prevent an attacker from gaining access to your email accounts even if they obtain your passwords somehow. So let’s see how to enable 2-step authentication for YahooMail, Gmail and Outlook to prevent attackers from accessing our emails. Enable 2-step authentication on YahooMail! YahooMail! is one of the most used free email services today in the world and as such one of the most targeted by hackers. Yahoo Inc. have tried in their capacity to protect our email accounts but we could add another layer of security by enabling the 2-step authentication on YahooMail! 1. Login to your YahooMail! account and click on your name by the upper-right corner of the window and select Account Info. 2. Under Sign-In and Security, click on the “Set up your second sign-in verification”, select your country and add your mobile number. Click on the “Send code” button. 3. A verification code will be sent to your number via SMS, and you will be required to correctly enter it on the page to verify your account. So next time Yahoo suspects you are not the one trying to access your email account as a result of location/IP change or use of an unknown device/computer, a code will be sent to your phone number via SMS which can only be used to verify and grant access to your Yahoo email account. No one can be able to access your YahooMail! account with a 2-step verification enabled, except the person has to somehow obtain your password and steal your phone at the same time. Gmail is yet another popularly used email service and with the rate at which Android users are growing everyone will soon own a Gmail or atleast a Google account. 1. Login to your Gmail account and click on your name by the upper-right corner of the window and click on “Account”. 2. 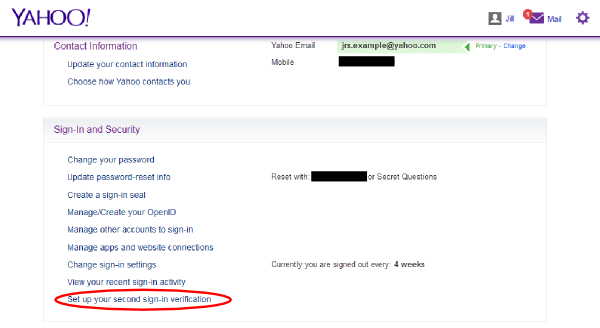 On the account settings page, under Security you will see 2-step verification,click on Setup. 3. Click on the Start Setup button, you may be prompted to enter your password one more time. 4. Select your country and enter your correct phone number, select either the Text message (SMS) or Voice Call and click the Send code button. Note: Your country may not be available for the Text SMS verification, in such case select the Voice call option. 5. Once your number has been verified, your account’s 2-step verification will be enabled. Your phone will be associated with your Gmail account. 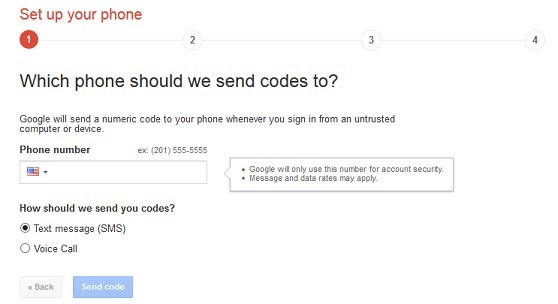 So next time you login from an unknown device or location, Google will send a verification code to the number you provided and will require you to enter it to gain access to your Gmail account. Alternatively, you can download the Google Authenticator app from the Play Store and use it to generate verification code every time you want to sign in to your Google account such as Gmail instead of bothering with SMS every time. Enabling 2-step authentication on Microsoft Hotmail or Outlook email account just as the previous 2 discussed above will add another layer of security to your email accounts and keep is safe from hacking. 1. Login to your Hotmail/Outlook account and click on your name by the upper-right corner of the window and select Account Settings. 2. Click on Security & Password and click on the “Set up two-step verification” link on the page. Follow the instructions to select the type of mobile device you use and click Next. 3. At this point you can download and install the Google authenticator app from Play Store if you use Android or Microsoft Authenticator if you use Windows phone. 4. 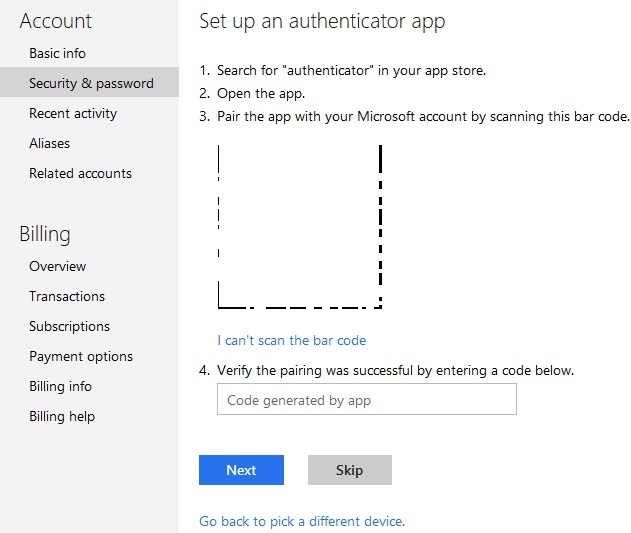 Open the authenticator app, pair the app with your Microsoft account by scanning the bar code provided on the page. 5. Then generate a code and enter it on the space provided on the page and click on the “Pair” button to verify the pairing. Once you’ve enabled 2-step verification on your Hotmail/Outlook account, you will require a verification code to access your account any time you want to login. I hope I have explained in simple terms how to enable 2-step authentication for Yahoo, Gmail and Hotmail/Outlook email accounts. You can secure your YahooMail, Gmail and Hotmail/Outlook by enabling the 2-step authentication so no one can gain access to your account from unknown devices or locations. Thanks for this tutorial on enabling send step verification for gmail, outlook, hotmail and yahoo mail. These days hacker are working hard to hack website and I can I personally experienced my own site. But taking safety measures it’s fine now. And recent a facebook page is also hacked named “Ranjinikanth Vs CID jokes” as facebook account linked to gmail we need to secure our account. Only problem is we need to carry our mobile where ever we go. thanks for tutorial really helpful for me. Thanks for the tutorial, Nwosu. What with major retailers exposing people’s information, we need to secure our accounts as much as we can.